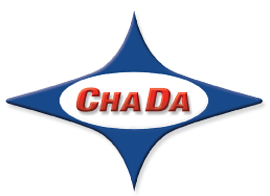 Vortex Valves & Gates – ChaDa Sales, Inc.
Salina Vortex manufacturers a comprehensive line of slide gates, diverter valves and iris valves designed to address the problems associated with traditional valve products. 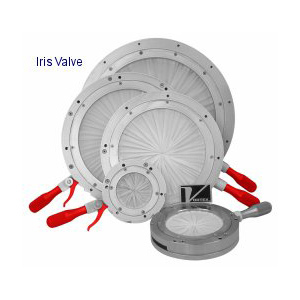 Vortex slide gates, diverter valves and iris valves are applied based on 25 years of proven application experience. 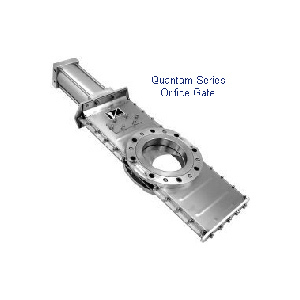 The Vortex Quantum Series Orifice Gate valve offers significant advantages over traditional knife gates and butterfly valves. Other gate valves, knife gates, slide gates, and butterfly valves rely on soft rubber seals that erode away or tear when handling dry bulk material. The Vortex Quantum Series Orifice Gate valve eliminates these problems by using “live loaded,” hard polymer seals. 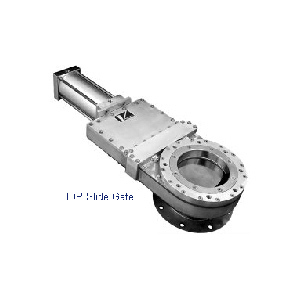 The Vortex Hand Slide Orifice Gate valve offers a dust tight seal when handling dry bulk material in gravity flow applications. This manually operated slide gate is an excellent choice for bins, and hoppers where the use of powered gates is not feasible or desirable. 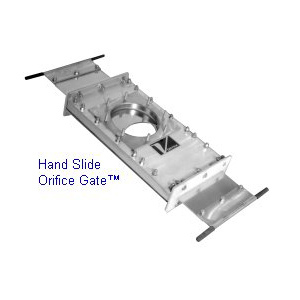 The design of the Hand Slide Orifice Gate is particularly appreciated by companies that utilize ibcs and totes because it totally “blinds” the opening. 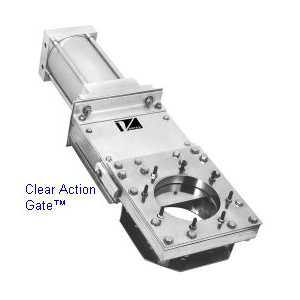 The Vortex Clear Action Gate valve is well-suited for installation above a rotary air lock that is feeding into a pneumatic conveying line. It will seal conveying air loss above the rotary feeder. With its stainless steel internals, this valve is it an excellent choice for food applications. Bonnet seals easily replaced while gate is in service. Designed specifically to handle dry material. 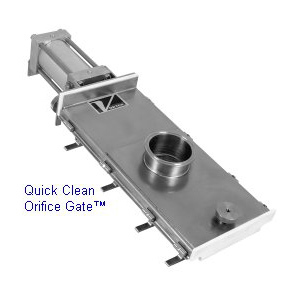 The Vortex Quick Clean Orifice Gate valve is ideal for industries handling dry products requiring a valve that needs to be cleaned often (pigments, sticky materials, dry foods, dry dairy products, and pharmaceuticals). It is an excellent choice for applications requiring daily sanitation of equipment to eliminate potential growth of bacteria and micro organisms. With the Vortex Roller Gate valve, there is no metal on metal contact between the blade and the valve body. This feature eliminates the associated gate seizing and binding seen with other slide gate valves. 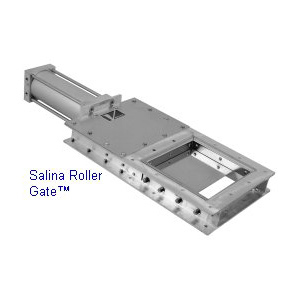 The Vortex Roller Gate is an excellent choice for handling sticky material. The Vortex Aggregate Gate valve is designed to meet the demanding applications associated with handling materials such as sand, gravel, whole grains and coal. Many options are available to accommodate abrasive material and harsh environments. Designed specifically to handle abrasive material. 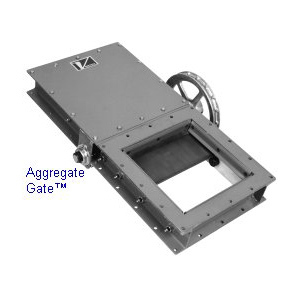 The Vortex HDP slide gate contains a patent pending, self-adjusting blade and clevis. This feature allows the blade to slide horizontally and then rise vertically into the closed / sealed position. Seal contact and associated seal wear is greatly minimized. Wedging and packing of material into a valve seat is eliminated. 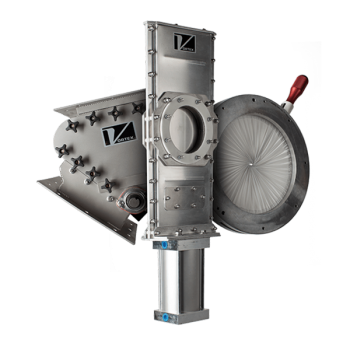 The Vortex Iris Valve offers a reliable valve to control the gravity discharge of free-flowing dry bulk material from bins, bulk bags, chutes and hoppers. A form-fitted, fabric sleeve provides a dust tight seal and a product barrier so material does not leak to atmosphere or come in contact with the valve’s actuating parts. This is an excellent valve for handling delicate or “friable” products. 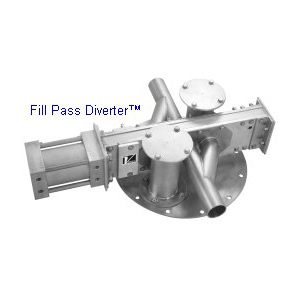 The Vortex Fill Pass Diverter provides a versatile and reliable method for filling one or more “in line” use hoppers when material in conveyed pneumatically (up to 15 psig) through a closed loop system. Positive material and air shut off for accurate scale weights. 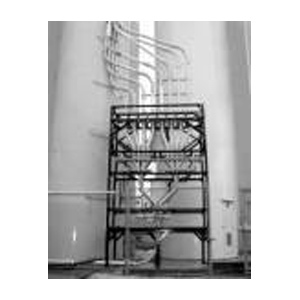 Spread stack design provides better material and air separation for reduced fill times. 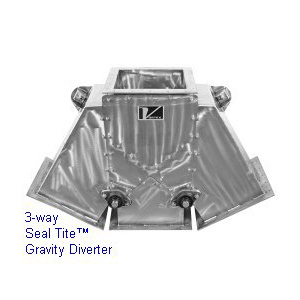 Stackable design allows easy installation of up to three diverter assemblies. 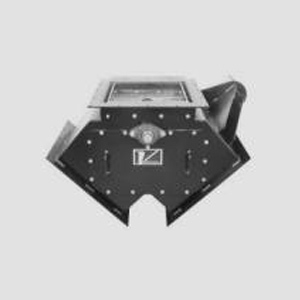 The Vortex Aggregate Diverter handles abrasive material such as sand, gravel, whole grains, and coal. Optional modifications are available for extremely abrasive applications where cross-contamination or material spoilage is not an issue. Removable access door for inspection or maintenance — bucket, inlet, and special liners may be replaced without taking valve out of place. Automates the pneumatic conveyance of dry material from multiple sources to multiple destinations. Eliminates the errors and safety hazards associated with hose manifold systems. 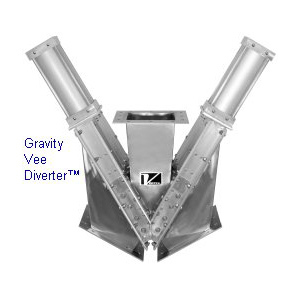 The Vortex Gravity “Vee” Diverter valve provides a dust-tight material seal in gravity or low pressure applications. Internal ledges have been eliminated to minimize potential material cross contamination. The Gravity “Vee” Diverter valve can be equipped with gate positioning controls for metering material flow in either direction. Dual gate design permits material shut off to either outlet and allows diversion on flowing material. Bonnet seals easily replaced while Diverter remains in place. 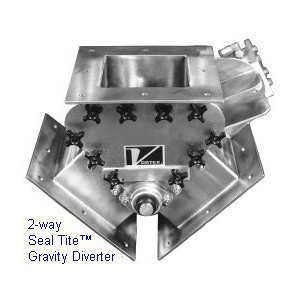 The Vortex Seal Tite Gravity Diverter valve solves many of the material handling problems found with traditional flapper diverters. Unique flow design protects leading edge seal.